Forty year old Ganga stays in a slum close to the derelict Union Carbide India Limited (UCIL) plant in Bhopal. She came to the city long after the gas leak. But Ganga shows symptoms associated with victims of the leak, nevertheless -- a burning in the eyes, cough, breathlessness, recurrent fevers, appetite loss, skin disorders, joint pains and anxiety attacks. Her children undergo similar agony. So do many others living in the vicinity of the plant: an unpublished study by a local non-governmental organisation (NGO), Sambhavna Trust confirms this. Ganga and people like her are victims of the UCIL plant's lethal chemical stockpile, amounting to 2000 metric tonnes (MT). Over the last 19 years, they have leached into the groundwater and contaminated the soil. At least 21 chemicals have been found in soil and water samples of five residential colonies close to the factory: J P Nagar, Kaindu Chola, Arif Nagar, New Arif Nagar and Atal Ayub Nagar, where 50,000 live today (see map: Areas most affected...). Chemicals have now entered the food chain; mothers feed toxic breast milk to their children. Nineteen years after it snuffed out 3,000 lives and crippled countless others, UCIL's Bhopal plant continues to maim and traumatise. Down To Earth secured exclusive entry into the factory premises. We found heaps of chemicals lying all over. Evidently, this is not a post-1984 development. Testimonies of ex-company employees and studies by the Centre for Scientific and Industrial Research (CSIR) and Indian Institute of Chemical Technology (IICT) now show that UCIL dumped toxic waste outside the plant much before the 1984 tragedy. The exact names of the dumped chemicals and heavy metals were provided in 1997 by an ex-Union Carbide employee -- T R Chauhan -- to a New York district court. Mercury was among these metals (see table: Toxic junk). UCIL used the metal extensively in producing Sevin (carbaryl). The metal used to be disposed wantonly, only to poison groundwater and soil. It remains a menace even today. A 2002 Greenpeace Research Laboratory study has confirmed high mercury levels in the soil and groundwater in areas around the the UCIL plant. Samples collected from a drain directly beneath the Sevin manufacturing unit of the UCIL factory "contained free mercury at over 12 per cent of the overall weight of the sample." The study also found high levels of chromium, copper, nickel and lead as well as toxic organochlorines, hexachloroethane and hexachlorobutadiene -- common constituents in solid wastes of the chlorinated chemicals industry. In 2002, the Dehradun-based Peoples' Science Institute (PSI) collected water samples from six hand pumps in different colonies around the plant. 75 per cent of them had mercury levels higher than that recommended by the Bureau of Indian Standards, (1 microgramme per litre, g/l); at Arif Nagar the mercury content was as high as 70 g/l, it was an equally high 56 g/l at Atal Ayub Nagar. PSI used a topographic map to infer that groundwater contamination was spreading rapidly towards areas in the north, north-west and north-east of the factory. Another study in 2002 by toxicologist Amit Nair and the Delhi-based NGO, Srishti -- in the five worst affected residential areas -- showed that food, soil, waterand breast milk were contaminated by heavy metals such as nickel, chromium, mercury and lead, volatile organic compounds like dichlorobenzene and halo-organics like dichloromethane and chloroforms. "In Bhopal cancer takes the easiest and shortest route to inflict children: breast milk," says Nair. Following a huge public outcry against the plant, the state government investigated it way back in 1994. 44 MT of tarry residue -- generated during manufacture of Sevin -- and 2.5 MT of alpha napthol were found. These hazardous wastes were subsequently shifted and stored in a covered area. The Madhya Pradesh (MP) government has other incriminating evidence against Union Carbide as well. Documents made available to Down To Earth by state officials in 1991 and 1996 (when UCCIL still owned the plant) reveal that the Madhya Pradesh Public Health Engineering department's State Research Laboratory tested 11 groundwater samples from the five worst affected colonies. The samples had chemical oxygen demand (COD) between 45 g/l and 98 g/l. (The World Health Organization (WHO) has fixed 6 g/l as the standard value of COD for natural water). Water samples from other parts of the city were also tested but no contamination was detected. Clearly, the UCIL plant has put paid to the groundwater quality in its environs. But, the government chose not to act on these results. They remained cocooned by the Official Secrets Act. 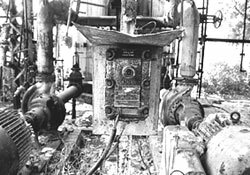 In 1996, the Central Bureau of Investigation investigated the plant. It directed an expert body from the Madhya Pradesh Pollution Control Board, NEERI and IICT clean up the plant premises. The experts stated unequivocally that wastewater spilt out of the plant, contaminating groundwater. But the government paid no heed to their warnings. Down To Earth has studied documents that are part of the government's investigation process. They reveal Union Carbide was aware of the health hazards of its Bhopal plant as early as 1989. Carbide's own laboratory tests done that year revealed that soil and water samples collected from near the factory vicinity were toxic to fish. In 1994, Carbide commissioned NEERI to study soil and water contamination from the factory . The report noted 21 sites inside the plant to be highly polluted. Union Carbide has not acted on any of these reports. While the plant continues to maim and kill, the center, the state government and Union Carbide hem and haw over who should do the clean-up. Litigation too has become a drag. A victims' group has demanded in the Supreme Court that Dow Chemicals, owner of Union Carbide since February 2001 clean up the plant. In 1999, a similar case was filed in a lower court in New York, USA. In August 2003 the Madhya Pradesh government jumped into this litigation to claim money from Dow. "The contaminants are highly specific in nature and decontamination cannot occur without Union Carbide's co-operation," stated a state government official in the US court. Meanwhile the aftermath of Bhopal threatens to become deadlier than the night itself. The survivors drink poison everyday. What is this doing to their already blistered bodies? Who knows? Who cares?